On the remote planet of Eloia, Dex and Leanora live in two worlds that intersect: the world of seeing and the world of the blind. Leanora alone travels between them. But she keeps her limited eyesight a secret from the boy she loves most in the world. Then tragedy strikes: Leanora and Dex must trek across Eloia in search of answers while struggling to survive in the harsh wilderness. Leanora’s mother, believed to be dead, has left traces of herself in every community they encounter. 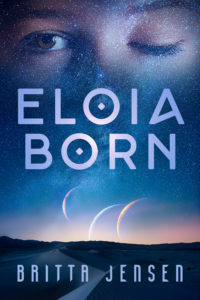 Eloia Born is the first in a two book series. Buy your author signed copy of the paperback today. Glossy cover, ivory B&W interior. 287 pages. Published in 2019 by Murasaki Press. Indicate on your order who you would like the book to be personalized to, if desired. Orders come with free postcards and stickers from the book’s launch. Describe how you would like the signature personalized--e.g. to whom should the signature be addressed.